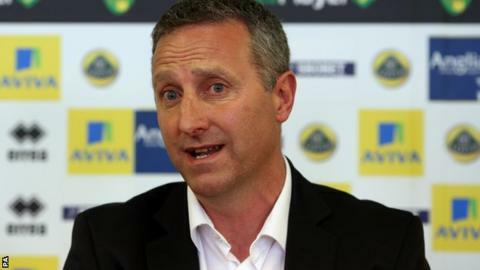 Norwich City's new boss Neil Adams believes Premier League survival does not rest on Saturday's trip to Fulham. The Canaries are five points and one place above Fulham, who occupy the final spot in the relegation zone. "I don't think it is a decider. People will say 'he's got to say that'," Adams told BBC Radio Norfolk. "It's a massive game and if we win it, we do ourselves no harm at all. But it isn't a must-win because there are four more games." Those four games after this weekend are a home fixture against league leaders Liverpool, trips to David Moyes's Manchester United and second-placed Chelsea, and finally the visit of Champions League-chasing Arsenal. "We know what those other four are, they're against four of the best teams in Europe," said 48-year-old Adams. "We're capable of beating teams. We won't turn up anywhere expecting to get beat." Adams, a former midfielder who played more than 200 times for Norwich, was promoted from youth team manager following the sacking of Chris Hughton on Sunday. A victory against Fulham in his first game in charge would take the Carrow Road side to 35 points and potentially 13th place, if results go their way. But Craven Cottage has become a desperate place for Canaries supporters, with Norwich's last win there coming in 1986. Norwich have conceded 16 goals in their last four visits to the West London side, including a final-day 6-0 thumping that saw them relegated to the Championship in 2005. Adams was there that day, working as a summariser for BBC Radio Norfolk. "What's happened has happened. The 6-0 was a horrible day. But it's history. "Yes, things do tend to have trends. But we have different players and different staff. It's just the same ground against the same team. "People will look at the stats but I won't let that affect me."